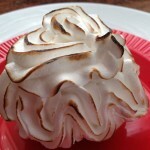 Baked Alaska happens to be one of my all-time favorite desserts!! Not only do I love the combination of brownie, ice cream, and toasted meringue…I love flaming it at the table!! Start this dessert at least one day before you plan on serving it. Line a 3 qt. bowl (8 ½ in. diameter) with foil. Pack the ice cream into your bowl; layering if you are using different flavors. Tip: Let the ice cream soften at room temperature, just slightly, before putting into your bowl. Cover the top with plastic wrap and freeze overnight. Wrap your baked brownie layer with plastic wrap and freeze. Make the meringue only after your ice cream and brownie are frozen. Mix granulated sugar and cream of tartar until the cream of tartar has disappeared into the sugar. 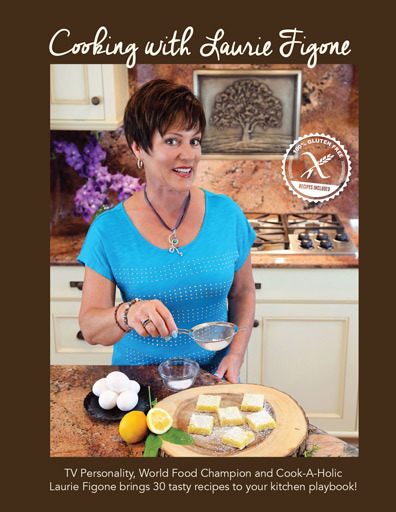 Place in top of a double boiler and add your room temperature egg whites. Over simmering water, cook stirring constantly with a whisk until mixture reaches 160’ (takes about 15 minutes). Immediately pour hot egg whites into your mixer. Beat at high speed for 5 minutes, or until soft peaks form. Remove ice cream from the freezer, invert and peel off the foil. Set ice cream on top of frozen brownie layer. Immediately spread meringue over entire surface, making sure all of the ice cream is covered. Freeze at least 4 hours. 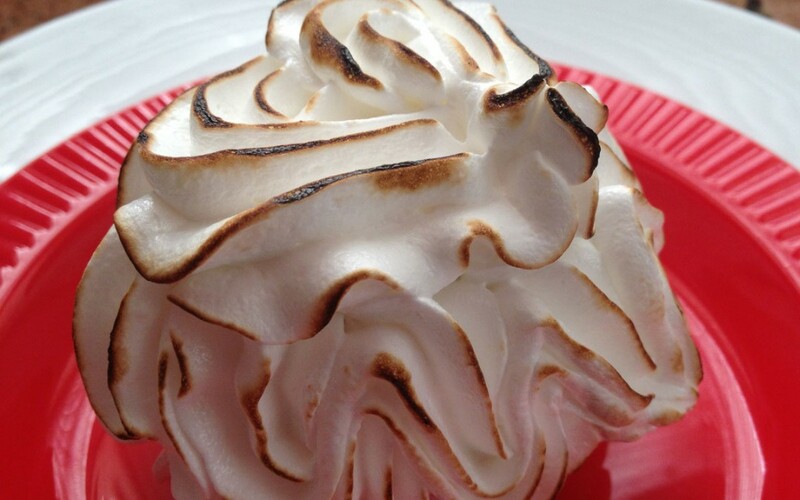 Note: At this point, you can wrap your Baked Alaska and keep in the freezer for one month. Adjust oven racks so your dessert will fit. Preheat oven to 500’. While oven is preheating, set a large cutting board on the table where you will be flaming your dessert; this is to set your hot plate on when it comes out of the oven. Measure your brandy/rum into a 2 cup glass measuring cup (this works best when pouring the flaming alcohol onto your dessert). 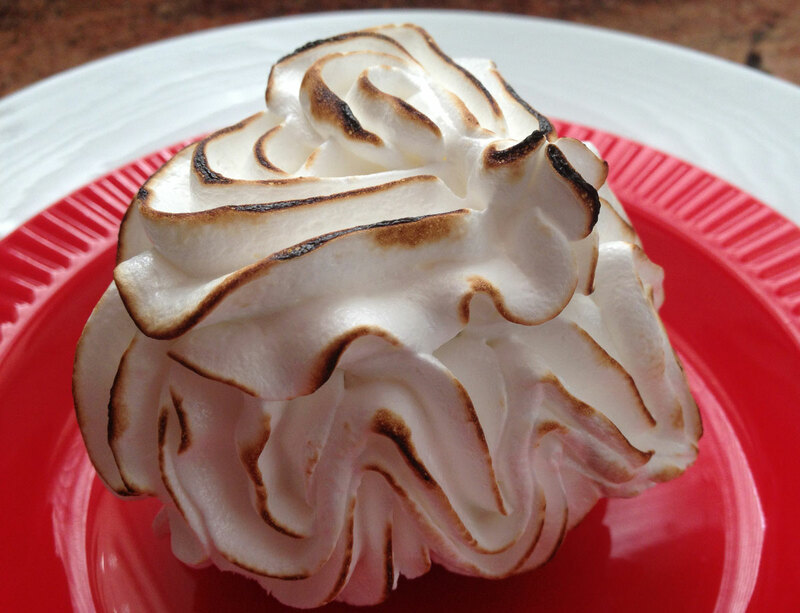 Remove your meringue covered dessert from the freezer and place on an oven proof platter; the larger the better to prevent flames from spilling onto your table. DO NOT use a platter taken from the freezer to the oven. Immediately bake for 2 minutes, until evenly browned. Remove from oven and place onto your cutting board. Have someone turn off the lights while you heat your brandy/rum in the microwave for 20 seconds. 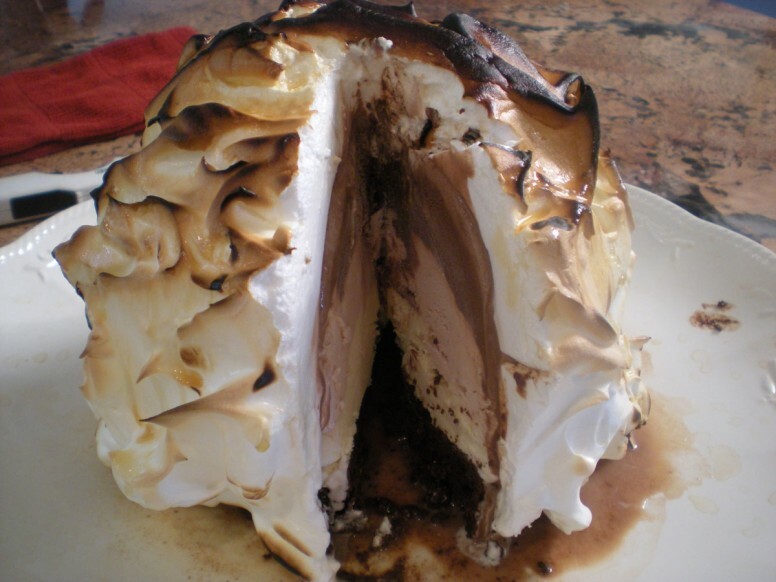 Carefully ignite your alcohol, and very slowly pour over your Baked Alaska holding your hand above the flames. Once the flames have died out, slice and serve.